These quality 2 and 3 bedroom double storey villa apartments in West Hobart are located an easy distance from Hobart CBD and all its attractions and sights. 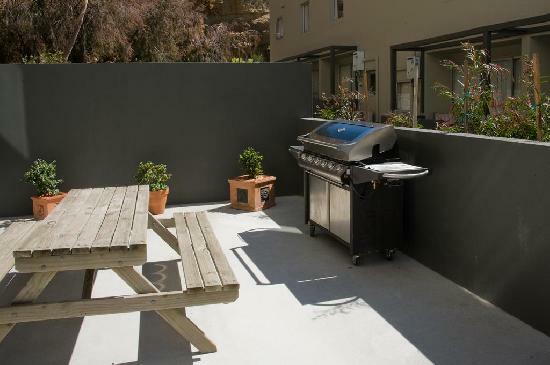 Located close to North Hobart's restaurant precinct, Bay View Villa Apartments are ideal for families, groups and corporate travellers requiring spaciousness and fully self contained accommodation during their visit to Hobart and southern Tasmania. All types of travellers can take advantage of the discount accommodation at the Bay View Villas Apartments, as well as the range of modern amenities including faxing facilities, free car parking, tour desk, garden and baby cots available. The property is ideal for families, or for the corporate traveller who wants to get away from it all. Located close to North Hobart's bustling restaurants and is a perfect base from which visitors can experience all the major tourist attractions of Southern Tasmania. Please note that Bay View Villas is currently under redevelopment, therefore access to the to the pool, spa and games room is not available. . Nearby Attractions : Located nearby are:, Historic Battery Point, North Hobart's restaurant precinct, Salamanca Place, Royal Tasmanian Botanical Gardens, Theatres, museums and galleries. 1 Bedroom Apt Warwick Cottage : Sleeps up to 2 guests on 1 Queen. 1 Bedroom Villa : Sleeps up to 3 guests on 1 Queen Bed + Sofa Bed Extra. 2 Bedroom Executive Villa : Sleeps up to 4 guests on 1 Queen & 2 Single Beds. 2 Bedroom Harbour Villa : Sleeps up to 5 guests on 1 Queen & 2 Single Beds + Sofa Bed Extra. 2 Bedroom Villa : Sleeps up to 5 guests on 1 Queen & 2 Single Beds + Sofa Bed Extra. 3 Bedroom Villa : Sleeps up to 7 guests on 1 Queen & 4 Single Beds + Sofa Bed Extra. Townhouse - 2 Bedroom : Sleeps up to 4 guests on 1 Queen & 2 Singles.